Ah, snacks. 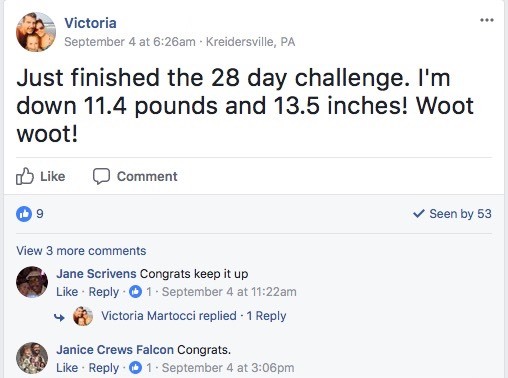 The downfall of many a dieter. Especially when you’re trying to stick with the ketogenic diet. Snacking often leads to weight gain because of what and how we eat. A lot of ready-made snacks contain a lot of sugar and carbs, and very little nutrients. Also, if you are snacking while doing something else (like watching a movie), it is easy to lose track of how much you have eaten. This combination quickly leads to weight gain. For me, the snack options are one the best parts of following a keto diet. You’re telling me that I should be eating this cheese-stuffed bacon-wrapped meatball? The only hard part of that is limiting it to just one. Although it might not be often that you will feel the need for snacking – the high-fat content of your meals will keep you feeling fuller for longer – it is always good to have a few easy recipes on hand for when the need strikes. There are many snacks that you can have while following a keto diet that are very quick and simple to put together – a handful of nuts, and few blocks of full-fat cheese, pickles, etc. But there are times when I want something a bit more elaborate. 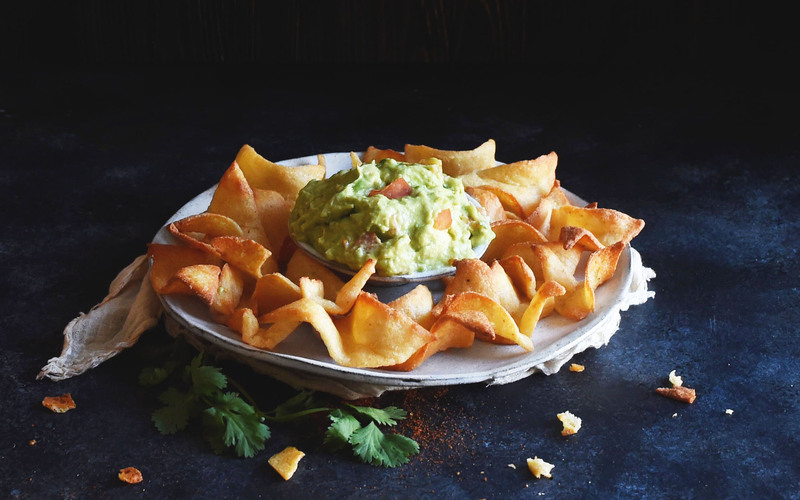 These savory snacks that I have rounded up for you will take a bit more time and effort than simply slicing an avo in half, so they are more suitable for when you have some time to prepare them. I like to make these sort of snacks when we are having guests over, or when visiting friends. They are always a hit! This snack is going to be simple to make. It’s simple, small, and delicious. When you have a snack like this, you’re going to be able to fulfill the needs you want. You get something that isn’t too filling and something that can definitely satisfy any sweet cravings you may have in between meals. Chips and salsa are a staple for parties and game nights (both the charades and sports variety). I may be eating keto, but that doesn’t mean I don’t eat chips. I just make sure the chips I do eat happen to be low carb. 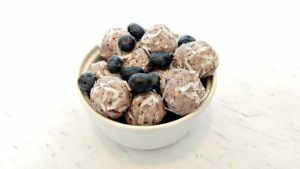 Buying low carb snacks gets expensive, so I am really excited to have come across this recipe. These Low-Carb Tortilla Chips use a combination of mozzarella cheese and almond flour (a keto-dieter’s best friend). Just because you are eating low-carb doesn’t mean you have to give up delicious baked treats. There is always a way to make them keto-friendly. 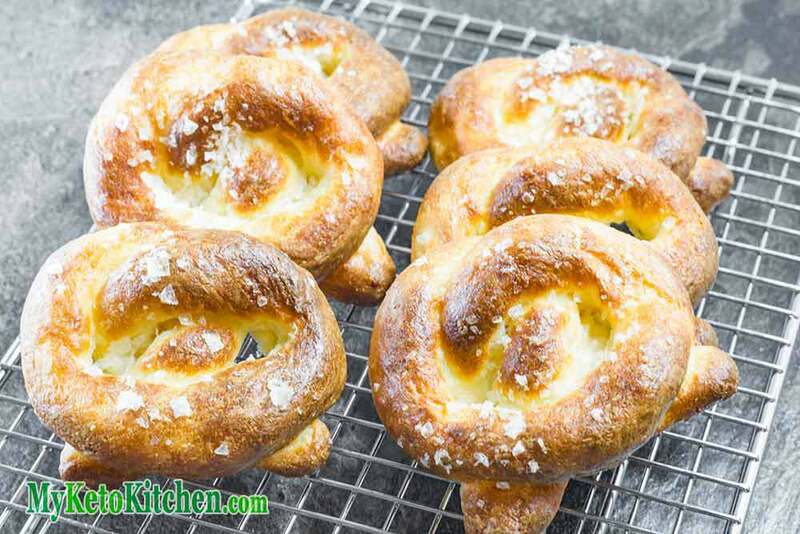 And this Soft Pretzel recipe is a good example. Just look at the nutrient breakdown – 18g of fat and only 1g of net carbs per pretzel! These pretzels are best eaten on the same day they are made. (And in my house they wouldn’t last any longer anyway!) Serve with a good quality Dijon mustard for dipping. 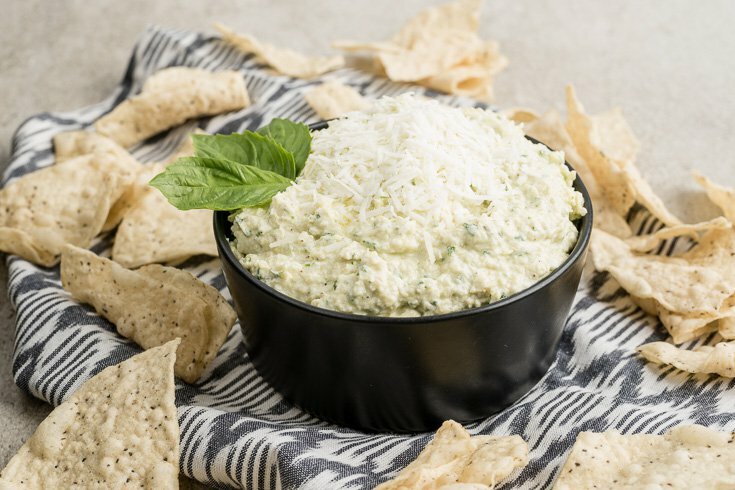 If you are looking for something different to the standard salsa and guacamole dips to dip your low-carb chips and veggies in, then this Goat Cheese & Artichoke Dip is a great alternative. Creamy and tangy – this seemingly odd combination works perfectly together, and the artichoke adds a good dose of fiber. Samosas are generally quite carb-heavy. Especially the potato-filled ones. This low-carb version uses mozzarella and almond flour for the pastry, and a mix of cauliflower and onion for the filling. 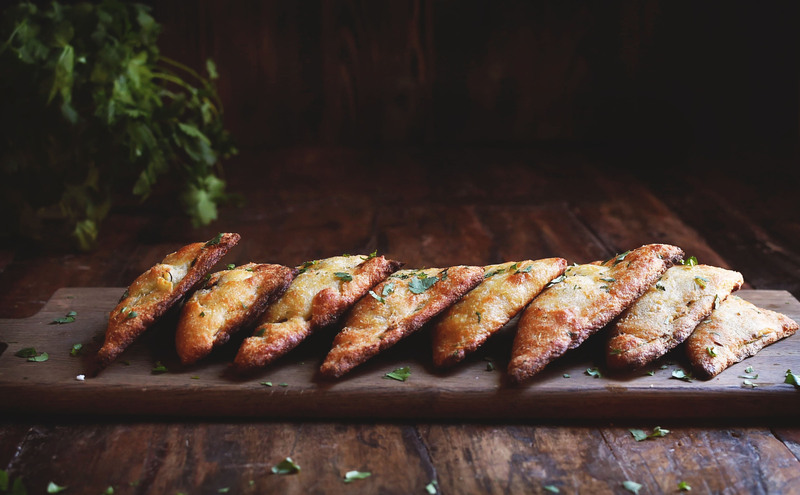 The mozzarella dough doesn’t taste cheesy, so these Low Carb Indian Vegetable Samosas have all the traditional Indian flavours. Samosas are quite portable, so make a great on-the-go type snack, and would be great at a picnic! 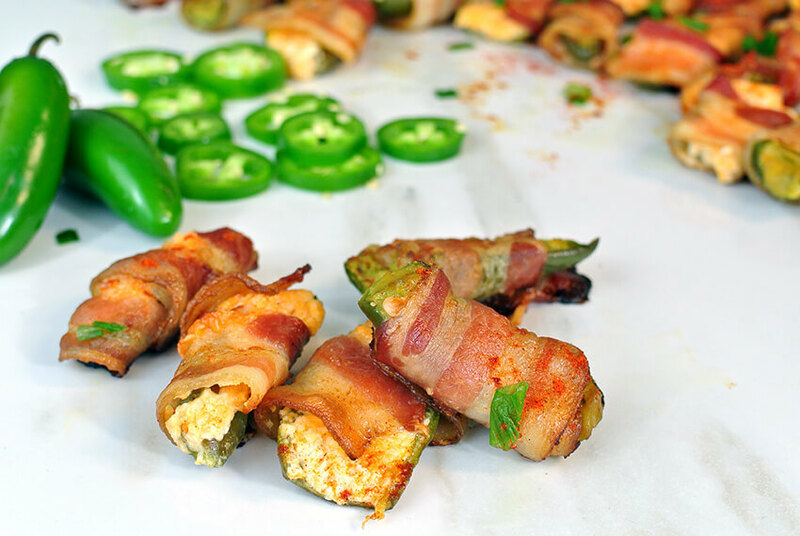 Bacon makes its second appearance in the form of these spicy Bacon-Wrapped Jalapeno Poppers. This recipe has quite a few steps and takes a bit of work, but once you take a bite of the spicy, cheesy, bacon-y goodness it will all be worth it. If your jalapenos are a bit too spicy you can cook the poppers for a bit longer – the longer you bake them, the less spicy they will be. This low-carb alternative to potato-based tots has a nice spicy kick with the addition of the jalapenos and chiles. (Although if you would prefer something less spicy, or will be serving them to kids, they are just as tasty without the jalapenos). These Green Chile & Bacon Cauliflower Tots can be eaten on their own as-is, or dipped in salsa. I love how versatile cauliflower is – from rice, to mash, to ‘buffalo wings’, its uses seem to be never-ending! I was never a fan of olives growing up – the flavor was always too strong for me. But as I have (ahem) gotten older I am starting to enjoy them more. 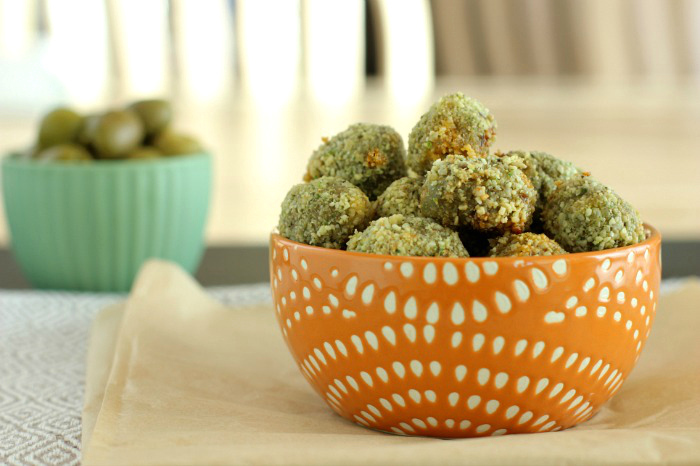 These Oven Fried Stuffed Olives are a perfect bite-sized appetizer. Olives are full of healthy fats, and stuffing them with the sausage makes for a unique snack! I don’t know about you, but I could happily eat avocado every day. Chopped up in a salad, as guacamole in a lettuce wrap, or just on its own with some sea salt and cracked black pepper. I am happy whenever avocado season rolls around and I can stock up. 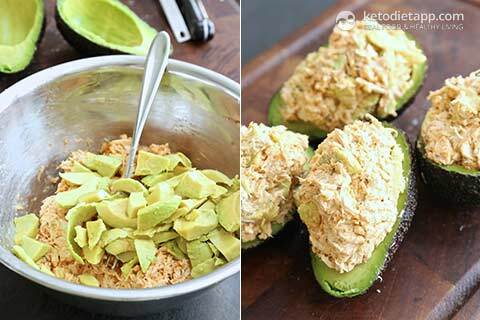 This Cajun Chicken Stuffed Avocado recipe gives yet another way to enjoy this amazing fruit. With over 50g of fat per serving, this is quite a substantial snack. Perfect for those extra-hungry days. 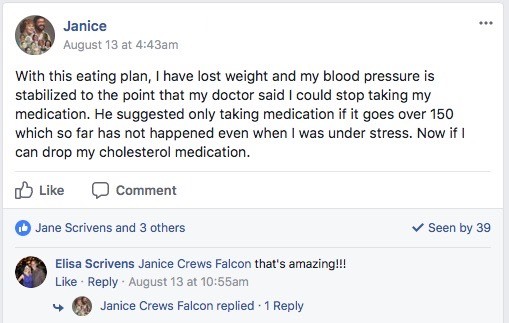 Over at Keto Dash we always talk about the virtues of eating keto snacks because psychologically you’re so used to snacking that there is no reason to break that habit. You just have to make sure you’re eating the right things and these keto snacks are a great start. 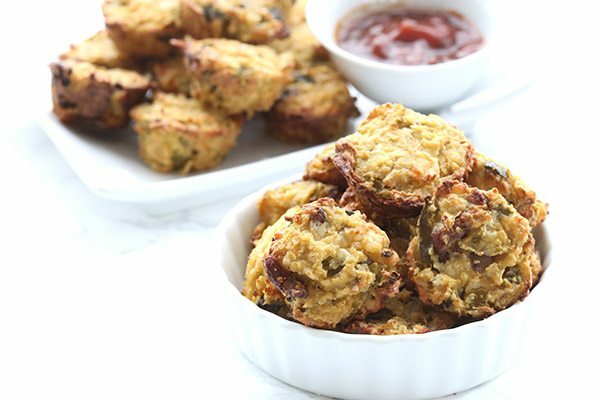 Enjoyed 9 Savory Keto Snacks That Will Help You Lose Weight? Share it with your friends so they to can follow the Miss Fit Living journey!